Who was this Egyptian baby? And how did he die? History records that early Pharaohs ordered slaves to be entombed with them, to continue their servitude in the afterlife. So when two experts examine the mummy of a baby boy, and discover what looks like a spike through his head, it's tempting to jump to dark conclusions. But who was this baby? How did he spend his short life? And how did he die? Was he the victim of a ritual murder? Or was the cause of death something else entirely? 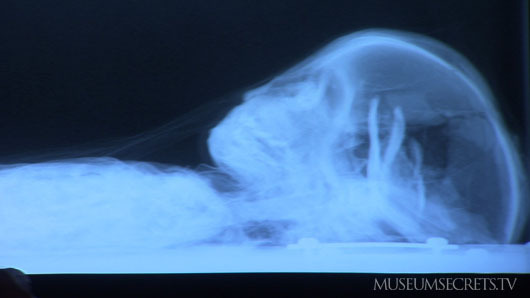 And what can his tiny mummified body tell us about life and death in ancient Egypt? What a tiny mummy whispers to Gayle and Andrew is revealed in Museum Secrets: Inside The Royal Ontario Museum. We won't spill the secret of how the baby mummy died (you'll have to watch the episode) but we will tell you the secret behind the secret: The ancient Egyptians were not who most of us think they were. Conventional wisdom holds that the ancient Egyptians were obsessed with death. Mummification and tombs of the Pharaohs seem to support this view. And we may also believe their culture was cruel, especially if we accept as fact the bible story of the Egyptian king who ordered the deaths of the first-born sons of the Israelites. But many modern Egyptologists, including Gayle Gibson, believe the facts point in a completely different direction. They believe that Egyptian culture was based on a deep reverence for life. And they feel the most compelling evidence can be found in artifacts that demonstrate how Egyptians revered the lives of their children. 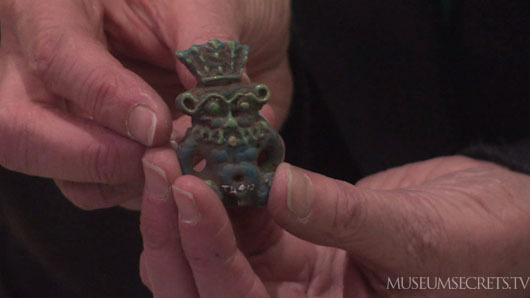 Find out how ancient Egyptians sought help from their gods to protect children from harm in this Web Exclusive Video: Frightening Amulet. And if you're wondering what it takes to be in charge of the care of ancient human remains... find out by watching this Web Exclusive Video: Meet Gayle Gibson. It is no secret that every mummy on display was exhumed from a grave intended to be their final resting place. From the tombs and crypts of Egypt there has been a diaspora of the dead. Families that were buried together were not kept together by the world's archeologists and museums. Often the remains of loved ones now exist far apart - separated by continents and oceans. 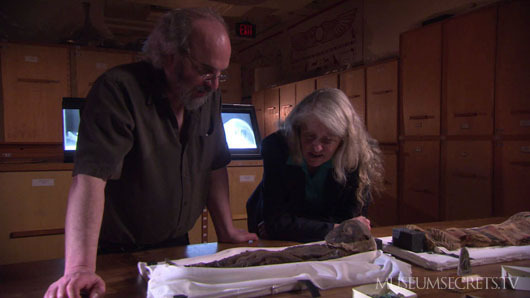 But ROM Egyptologist and teacher, Gayle Gibson, believes one mummy in the ROM collection is closely related to a mummy in a museum in Chicago, just a few hundred miles away. 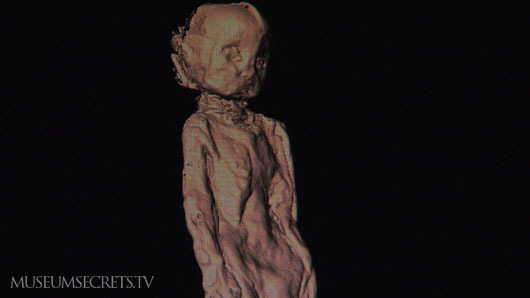 Discover how she came upon this secret, and retrace the trail of clues she followed to uncover a 3000 year old love affair in this Web Exclusive Video: Mummy Love. Curator Gayle Gibson (and many other Egyptologists) believe that the Christian idea of the resurrection is derived from Pharonic theology. Skeptical? We invite you to find out about the Egyptian god of the afterlife: Osiris.